Ryan plays in a street-hockey league in the summer. He’s back with the same coach that led the team to the championship last year, and they’re off to an undefeated start. There’s just one problem: their regular goalie is going to miss a game this week. Ryan immediately volunteered to fill in. It is a sign of how far his coördination and ability have come that we enthusiastically backed Ryan’s quest to play goal. A few years ago, we would have discouraged him from doing so, both because he wasn’t very good but also because we weren’t sure how he would react if he didn’t play well. This time, it’s very different. He’s good enough to do the job and even if he gives up a few goals there are no fears of a meltdown or blaming his teammates. Sunday was Ryan’s big practice tryout in net. The coach told him to be ready to play goal all practice, and he would work with him, evaluate him and make a decision. Ryan was very excited. He didn’t complain about having to wear long pants and sleeves in the heat — and that was before he had to put on all the goalie equipment. He took direction well — and there was lots and lots of direction — and tried his best. I saw genuine improvement from the start of the session to the end. Poor coach. Every few minutes Ryan asked if he had done enough to earn the start in goal. Coach pointed out that, yes, Ryan hadn’t allowed a goal in the scrimmage but that he had only faced a couple of shots. 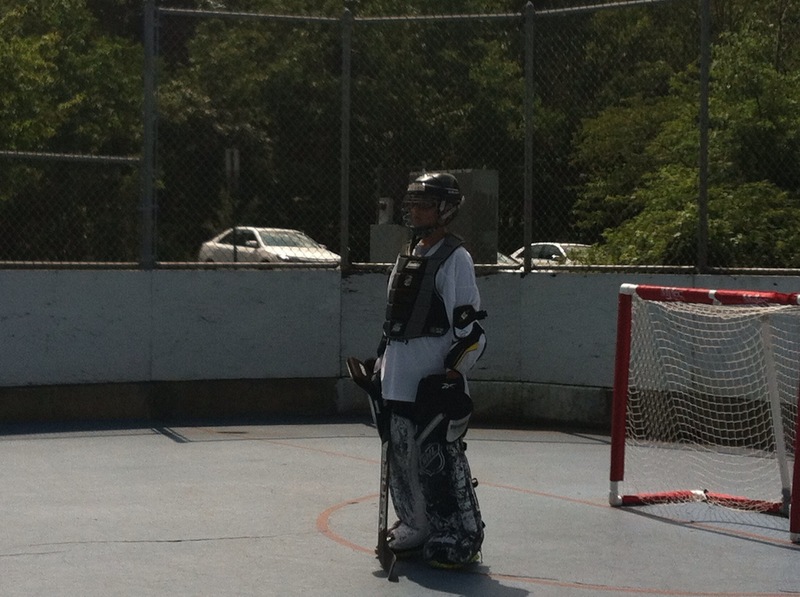 Ryan willingly stayed after practice for almost an hour to continue to work on his goaltending. I hinted to the coach that Ryan might do better if he gave him three or four things to think about, not dozens. He was very enthusiastic and really trying to help Ryan, but he was giving him so many pointers that I could see Ryan tuning out. Ryan continued to work at it, and continued to ask if he was going to play in the game. The coach finally committed to giving him an answer by Tuesday. To my shock, Ryan accepted this and stopped asking. Well, he stopped asking the coach. He continued to badger me if I thought he was going to play. I told him I was, and reminded him that the coach was just trying to figure out the best way to help the team. If he decided the team was better off with Ryan playing defense instead of goalie, that was OK too. I think Ryan accepts this. He understands the concept of team and is a selfless player. He really, really wants to play goal, but he wants to be a good teammate too. Selfishly, I want him to have a chance to play goal, to show what he can do. Even if he doesn’t, I’m excited about how far he has come, athletically, socially and as a teammate. I would hate to have to make that decision. But your answer of the team needing him more in defense was a great answer. Personally paying goalie, catcher, etc… I never thought it a wise idea to put myself in a sporting position where I had to throw myself infront of a hard, fast moving object.